CHRISTMAS IS COMING. It’s meant to be a time for family, friends and feasting but sometimes Christmas cooking can lose its sparkle. This time of year can be a minefield of unachievable menus, fussy eaters and, of course, the pressure to deliver. But what does the ‘perfect’ Christmas meal really boil down to? I’ve scoured the Christmas cookbooks and consulted some no-nonsense chefs to put together the ultimate guide to cooking on December 25, from the recipe planning to the final spoon of dessert. Anyone who knows their onions understands that preparation is key for Christmas. In our house, recipes are broken down into a running order and timing list. It’s a game changer. Two Christmas guides I swear by are Darina Allen’s Simply Delicious Christmas, a book we grew up with and a favourite in many Irish homes, and Nigella Lawson’s hugely popular Nigella Christmas. The verdict: Make like Santa and get your list sorted first. It’s imperative to keep it simple here. Graham Herterich, baker and chef, always serves a retro 1970s prawn cocktail, as does chef Hilary O’Hagan Brennan. In Simple Delicious Christmas, Darina recommends soup as a starter: made ahead, frozen and packed with seasonal winter veggies. The verdict: Keep it simple. Salmon, prawns, pate or soup are great options. In Ireland, we still fully embrace the traditional turkey and ham. 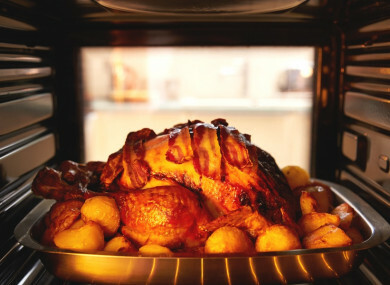 In the four week period up to December 31 last year, Republic of Ireland households bought 6.8 million ham joints and 4.8 million turkeys, according to Kantar Worldpanel. If you are tackling a turkey this year, what can you do to get it right? Nigella’s turkey brine recipe took off a few years ago and many home cooks swear by it (me included). The recipe involves submerging the turkey in a spiced brine mix overnight before you cook it, to keep the bird plump and moist while roasting. The verdict: A bit of turkey brining and the traditional trimmings should keep everyone happy. Not every house is going to partake in turkey and ham, of course. “I’m not a huge fan, we’ll have slow-braised lamb this year,” says Graham Herterich. Darina Allen offers up a few suitable alternatives – a roast goose with potato stuffing or a smaller roast pheasant for a party of two or three. But what if you’re looking for a meat-free main? Is the much dreaded nut-roast mandatory? For veggies at the table, I favour a roast stuffed pumpkin, or a whole roast cauliflower. You can easily cook both with the typical Christmas flavours of herbs and onions, served with the usual trimmings. The verdict: Skip the nut roast this year. Now we really get down to the important stuff – the sides. Would we be so enthusiastic about Christmas dinner if there wasn’t a table laden with all sorts of sides, sauces and stuffings? Stick to the family recipes here. “Everyone has their own stuffing recipe with that secret ingredient, their own way of making the perfect roast potatoes and die-hard rules about how to make the gravy,” says Clodagh McKenna. For Graham Herterich it “has to be my brother in law’s sausage meat stuffing”, whereas in my house my dad serves up three separate types. Gravy is a given but Christmas is also a time of year where every other sauce option seems to appear: cranberry, Cumberland, mustard. Almost every chef and cook I polled insisted on DIY sauces. Homemade cranberry sauce, for example, is a no-brainer while fresh cranberries are relatively easy to come by. Nigella Lawson’s simple version with cherry brandy is divine – you’ll be surprised at just how easy it is. The verdict: You can’t beat homemade stuffing and sauce. Christmas is famously the meal that goes on forever: pudding, mince pies, trifle and cheese. If you’re looking for traditional, turn to Darina Allen, who gives us every option for dessert in Simply Delicious Christmas. I adore her Proper Trifle made with sweet sherry, homemade sponge cake and egg custard. The verdict: If in doubt, one dessert option and a cheeseboard will do. Email “Turkey or roast beef? Here's what the ideal Christmas dinner looks like, according to the experts”. Feedback on “Turkey or roast beef? Here's what the ideal Christmas dinner looks like, according to the experts”.